Go ahead, light my fire! 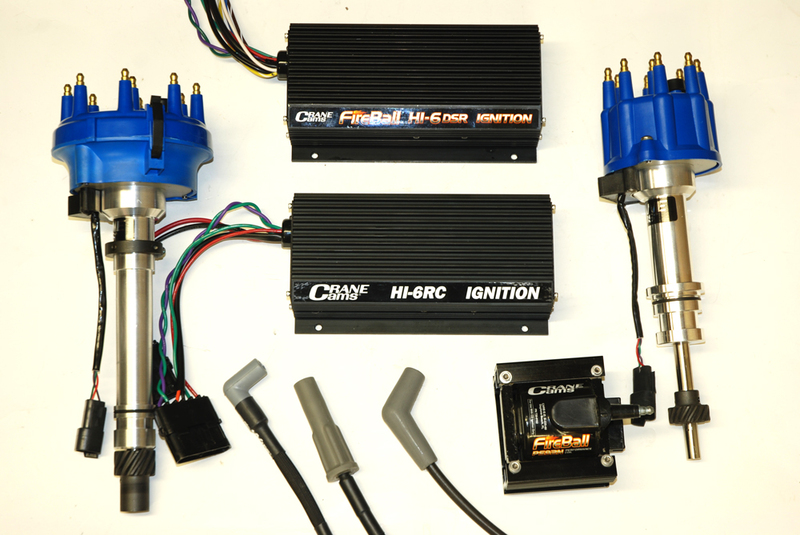 Today, you have all sorts of options when it comes to an ignition system for your racecar. Systems are diverse: Analog, digital, magnetic pickups, optical pickups and so on. Claims for ignition output range from the sublime to the absurd. There are some big name systems out there, along with plenty of newcomers. The trouble is, some of the advertising claims are just that: Claims. No secret. And something else that’s no big shock to most seasoned racers is the fact some of the more publicized, high profile systems might not be as good as you once thought. The reality is, there are some ignition systems out there that are fraught with technical grief. One setup we have confidence in is Crane’s lineup. Not only is it well proven, Crane has also been a real innovator with technology. Case-in-point are their race distributors. 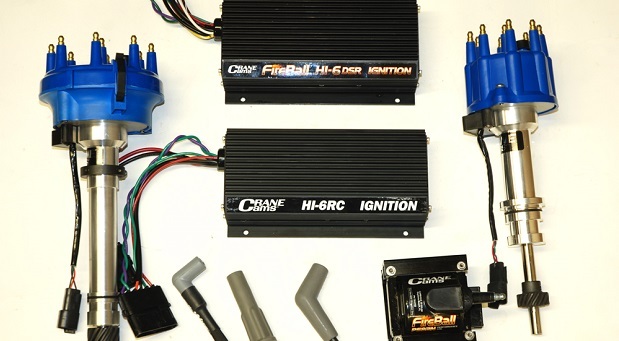 Engineered expressly for drag racing and oval track applications, these analog distributors are extremely simple. There is no advance mechanism, which means timing is locked out. The housing for each distributor is a CNC-machined billet aluminum piece with bearings top and bottom (the top bearing is actually a high end zero end play roller bearing). Internally, the shaft is 100% machined from stainless steel. On Chevy versions, a slip collar mount is included (to allow for deck height changes). The trigger is a very simple (and equally robust) optical device. This provides for extremely accurate ignition timing (more below). For all applications, you can specify a large or a small cap. Obviously, a small cap is only advantageous when clearance is an issue (for example, a tunnel ram or a large case blower on a small block Chevy). Downstairs the distributor gear is a melonized job. We’ll get into the advantages, from a camshaft perspective later. Well-respected engine builder, Keith Dorton (Automotive Specialists, Concord, NC) tested Crane’s distributors against some other well known brands. The idea in the series of tests was to validate which distributors maintained timing over an RPM range of 4,000 to 8,000 RPM (which would be pretty much be the norm for either a sportsman drag racer or oval track racer). The Crane optical pickup distributors showed a timing variance of 2-1/2 degrees throughout the range. Meanwhile, a competing brand’s magnetic pickup distributor timing variance was almost double. Bottom line here is, the optical pickup distributor is a stable timing platform. And that should be good news for any racer. What’s the deal with the melonized gear? The process is proprietary and is actually called “Melonite™ and Melonite QPQ™. It incorporates a salt bath Ferritic Nitrocarburize procedure that uses a cyanide base. The process is accomplished at temperature of approximately 1,050-degrees F. During these processes, nitrogen, carbon, and small amounts of oxygen are diffused into the surface of the steel, which in turn creates an epsilon iron nitride layer. This property provides for a tough outer surface, but at the same time, it alloys the material to retain ductility, so strength isn’t diminished. What you get is increased surface hardness, lower coefficient of friction, enhanced surface lubricity, improved running wear performance, increased sliding wear resistance, and enhanced corrosion resistance (although corrosion isn’t usually a factor in a distributor gear). Bottom line? The melonized gear allows you to run the distributor on any sort of camshaft (material). And by the way, durability is exceptional. Next issue, we’ll dig deeper into Crane’s ignition systems. Stay tuned.